Dominion Brook Park is an amazing 11 acres on the Saanich Peninsula. It was created by the Canadian Department of Agriculture as a public demonstration arboretum and ornamental garden 1912 and immediately readied for planting under the direction of W.T. Macoun, Dominion Horticulturist, son of the world famous botanist, John Macoun. Plant material was ordered from well known nurseries in Britain, France, Holland, Germany, Japan and the USA. Of the hundreds of species planted many have not survived but an amazing number have grown to maturity. The plant selections and the layout of the park is incredible and masterly landscaped in the extensive variation of terrain which combines glades, dells and vistas with ponds and pools and Dominion Brook. The park has some interesting stonework as well. During the 80’s maintenance was reduced and the unique plantings began to disappear under ivy and blackberry. In the late 1990's a citizens group spearheaded by John and Katie Dawson led to the formation in 2000 of a volunteer non-profit society, "Friends of Dominion Brook Park Society" which now has over 200 members. In July 2009, a renegotiated lease for 25 years, with an option for a further 25 years, was signed between the Federal Government and the District of North Saanich. 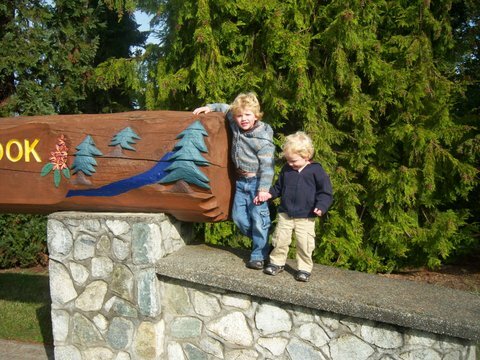 Dominion Brook Park has been part of Peninsula history from its inception when the B.C. Electric Railway stopped at the bottom of the park and brought large groups for picnics and holiday outings. Today, the park's popularity continues to grow with visitors and groups as diverse as the Basset Hound picnics, weddings, school outings, family gatherings, Geocaching and Easter Egg Hunts. The Park is open to anyone and if you would like to have a group function there, it is advisable to contact the District of North Saanich. You are invited to hold social functions such as group picnics, club outings, family celebrations in this lovely oasis in North Saanich. Contact: brobinson@northsaanich.ca. telephone 250-656-4185. This great little park is a gem in North Saanch just across from the Panorama Recreation Centre and is waiting to be discovered by you. Pictures have been provided by John Aston.